Unemployment rate may be defined as the percentage of people who are available, willing and seeking work who are not employed (unable to find an acceptable job). In the USA, the official unemployment rate is usually reported, based on those who have registered for unemployment benefits, which usually does NOT include: (1) those whose benefits have expired and are still not able to find suitable work, and (2) those who are underemployed (working fewer hours or at lower pay than professions they are trained-and-qualified for, and that they may have previously performed quite well, when the economy was doing better). 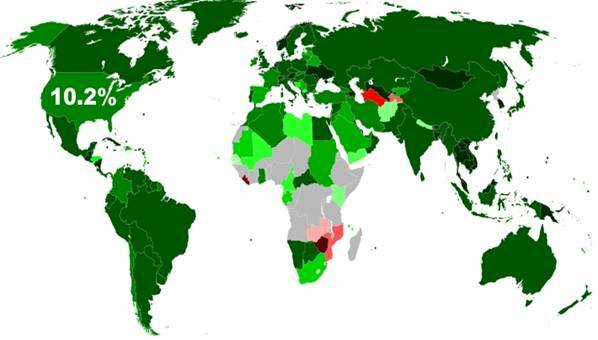 Unemployment Percentage is often roughly twice what the official unemployment rate states. By the end of 2009, the unofficial USA Total Unemployment was probably closer to 18%-to-20%. Minority unemployment can approach twice the rate for the majority category. Almost everyone had a close friend or relative who was in this unemployed or underemployed. Dissatisfaction with “the system” was extremely high. 44% of employed Americans said that they would like to leave their current job, but felt that they would not be able to find another one elsewhere. The 2010 job market for new graduates was the worst it had been since the 1973 - 1979 OPEC Oil Embargoes (for similar bad-energy-policy reasons). Capitalism was failing for the masses. Domestic jobs rose to a top national priority, as the value of U.S.-Dollar-based assets fell precipitously. Average U.S. income fell $2,000 per year under the Bush / Cheney Administration, while the cost of living continued to rise, and saving assets continued to decline. The middle class was badly damaged by Bush tax cuts for the wealthiest Americans, and heavily burdened with unprecedented un-payable regressive debt. In a disappointing, perverse way, PRODUCTIVITY IMPROVEMENT OFTEN INCREASES UNEMPLOYMENT. Before rural electrification and the rapid growth of internal combustion engines in the early 1900’s, it took roughly 41 farmers (plus animal muscle power from horses, oxen, mules, etc.) to provide the food for 100 Americans. Today, it takes less-than 2 farmers (depending on what you consider a “farm”) to produce far more food than 100 Americans need, PLUS, a few large commercial farm operations can profitably export significant amounts of some high-yield (genetically-altered) modern crops. Some low-wage low-quality largely-unmonitored overseas food sources use workers that earn 2% of what Americans do. When farm productivity increased well-over 20 fold (less-than-2% can do more work than over-41%), many farmers and farm workers could NOT make a living wage, and they became unemployed. Perhaps as many as 90% of today’s smaller farmers must work part time off-the-farm to make extra money to support their struggling farms today. With a population of over 300 million Americans, there are only about half-a-million large U.S. “Commercial Farms” with over $50,000 of gross annual sales. California has been America's most productive agriculture state. Now they have 12.5% unemployment. Man-made global warming reduced southern California rainfall by 48% for the most recent 5 years. Many millions of acres could not be planted. Unemployed American citizens must sadly stand in long food lines to receive contaminated canned food from China. The Luddites were a social movement of British textile artisans in the 1800’ who resisted industrial age automation - often by destroying mechanized looms, which they felt were leaving them without work and irreversibly changing their entire way of life. In 1811, handloom weavers burned machines that were increasing productivity and their unemployment. It was called the Luddite Movement. The term “Luddite” has been used derisively to describe anyone opposed to technological progress and technological change that improves productivity. Following a mass trial in 1812, many of the original Luddites were executed or imprisoned. The principal objection of the 1811 Luddites was against the introduction of new wide-framed automated looms that could be operated by cheap, relatively-unskilled labor, resulting in the loss of jobs for many highly-skilled textile workers. The cash registers at McDonalds (and many other “ Fast Food Nation ” companies) have recently done the exact same thing. Should displaced workers sabotage the means of improved productivity, which has led to widespread unemployment? Should we fight to restore the “good old days” when 41% of Americans had to be farmers? Should We Defend and SUBSIDIZE The Status Quo, to the exclusion of improved productivity? President Obama wants cars with a minimum of 62 mpg by 2025. Europeans already have efficient 5-passenger 78 mpg cars. Why have USA petroleum companies strongly RESISTED improved C.A.F.E. mpg standards, when the rest of the world has much-more efficient vehicles with many time better mileage and any American car, or heavy, unsafe SUV? is "owned" by big-oil-company lobbyists - the most profitable business in the world, and the source of the most corruption). Past-Peak Petroleum is obviously unsustainable suicide. We are headed for a predictable economic train wreck very soon. The Inevitable Is Unavoidable, AND it is not very far in our foreseeable future. It must result in much-worse unemployment. We badly need improved efficiency and productivity, BUT we also need creative new products that we can sell to the world. Declining business-and-government-as-usual is NOT the answer. We must educate and motivate Free-Thinking "Imagineers." Most of the 2008 super-corrupt Bush-Administration U.S. Federal Farm Bill benefits went to already-profitable commercial farmers with incomes over $200,000 per year, and a net worth over $2 million. It resulted in MORE perverse profit for the elite, NOT more food or jobs for the starving. Is unemployment (caused by new technology improved productivity) a BAD thing? It depends on your perspective. To the millions of American family farmers who could not compete with huge new factory farms, it was a TRYING TIME OF REEDUCATION – The old agricultural ways are gone forever. The “new world order” learning curve takes time and effort. It is changing much faster than non-learning workers and minimum-wage earners are adapting to it. Legendary Wild-West Cowboys and most Dirt Farmers had to cease to exist. They were FORCED to learn new jobs. If you want your car to go forward you put it in "D". If you want to back up, you put it in "R". Conservative obstructionists are the sinister evil nemesis of the rapid progress that we desperately need. 70% of Americans are predicted to LOSE THEIR CURRENT JOBS IN ONLY 5 YEARS. Reread that sentence again, and allow time for it to soak in. Do you think you are immune, safe and secure from predictable productivity improvements? Shall we all become luddites, who want to return to the failed declining selfish greedy policies of the past? WHEN (not if) electric cars replace an increasing number of obsolete SUV gas guzzlers in the 2010’s, those jobs will disappear forever, never to return. There is no “recovery” from progress. We simply do not need 41% farmers any more. AND, inefficient internal combustion engines are now a century out of date. 70% of today's jobs must be radically reinvented in only 5 years. The old General Motors went bankrupt, never to return to the status of “World’s Largest Corporation.” What is left may also soon die, UNLESS THEY RADICALLY REINVENT GM IMMEDIATELY. For GM to survive, its products must become nothing like the gross inefficiency that they are delivering today. When GM pays American labor-union workers $70 per hour plus benefits like health care (that is free in compassionate more-competitive nations), GM does not get a workforces that adapts well to long-overdue innovations. In contrast, Toyota pays their workers $35 per hour and they produce superior vehicles at lower cost with modern high-efficiency. GM is more than a dozen years behind the popular inexpensive Toyota Prius. 70 times more productive than those in India? SOMETHING MUST RADICALLY CHANGE. It does NOT bode well for U.S. jobs. Same old, same old cannot possibly restore America to its 1960's glory days, when gasoline was $0.19 per gallon. If we continue to do business-as-usual, while the world radically innovates, our rapid decline will accelerate into a nose dive. Electric cars have far fewer parts than obsolete, inefficient, internal combustion engines. Electric cars may go a quarter million miles without any significant repair work needed. Total replacement of an in-wheel electric motor is almost as simple as changing a tire. The skill to repair a gas guzzler will no longer be of much value, except for antiques. Right now, our international competitors are years ahead of American electric car technology, and innovating much faster than we are. Obama just subsidized manufacture of gas-guzzling Ford Explorers in his home town of Chicago - A giant step backwards. 170,000 U.S. gas stations should be phased out over time, as petroleum supply declines, and the price becomes unaffordable (over $5 / gallon - very soon). The world is constantly changing. Old jobs disappear, and new more-productive jobs MUST replace them. Instead of our obsolete 41%-farmer agrarian society, billions of people are now free to work on endless magical innovations, since we have electrified the world. From the perspective our Gross Domestic Product (GDP), higher productivity means higher nationwide prosperity. AND, higher profits for the elite bourgeoisie (owners of the means of production of goods and services). In an equitable world, the proletariat (workers who use the evolving new machines of industry to produce more goods and services) SHOULD receive higher wages for their higher productivity. Will tomorrow become more "fair" than today, OR will we have a bloody revolution of the majority? in the perverse modern American economic system, the opposite of fairness has recently been the case – high productivity often means the option of lower wages, or unemployment. How many highly-skilled Luddite handloom operators do we need to make the petroleum-plastic clothes that most people wear today? In 1964, world-famous, widely-recognized economist Milton Friedman understood the future PREDICTABLE result of higher-productivity and the growing unemployment crises. Fewer people would produce all of the food, clothes, houses, etc. that people need for a comfortable, prosperous life. What would we do with the unemployed MAJORITY? Should we just let them all starve out in the cold? (God forbid) Workers to NOT need a hand out. They need a hand up to a very-different tomorrow. Friedman’s NIT was an aggressive innovation concept that would have guaranteed that EVERYONE would have the basics of life like: food, clothes, comfortable homes, good education, transportation, secure nation (police, fire, military), and basic healthcare, regardless of their ability to work. Gene Roddenberry inspired many millions with his similar fanciful future, as humans were free to explore, and “go where no one has gone before.” In a Friedman / Roddenberry world of tomorrow, people, who were motivated to make more money, would be rewarded for their effort, but they would pay a flat-tax rate on the additional money that they made above the minimum. People who receive welfare entitlements would be given productive things to do that contribute to society (to their ability). Wouldn’t it be wonderful, IF we could replace today’s terrible, selfish, bourgeoisie greed with lifestyle security, and a genuine desire to explore infinite possibilities in an ever-expanding universe of endless enlightenment. Friedman was widely criticized for his “socialistic”, “communistic” suggestions. The whole idea of a more-efficient NIT (or other similar proposal) has always been politically infeasible (until this very day). We most certainly do NOT want to enable laziness. A series of U.S. studies in 1968 attempted to test the effect of NIT on work incentives. These early studies showed minimal disincentives. BUT, the results were very difficult to analyze, since the monetary benefits were rarely as generous as those already received through America’s traditional convoluted, perverse, overlapping welfare systems. The NIT effort failed due to widespread political resistance. BUT, the problem of how to deal with ever-higher productivity and unemployment marched steadily on. It is MUCH WORSE today than in the 1960’s. There are more unemployed Americans receiving welfare today than ever before in U.S. history. Since George W. Bush took office in 2001, U.S. productivity has significantly increased (as technological advancement has long predicted). This Unemployment / Productivity Paradox means that fewer people produce the goods and services that we need. AND, an increasing number of people are now unemployed – 15.5 million Americans - the worst since The Great Depression. Welfare roles have exploded at a time when tax revenues to pay for welfare programs have fallen, due to the unemployment crisis. It is a cascading, downhill snowball, growing larger as it gets larger. Under Bush, family income fell over $2,000 per year. In 2009, many productively-employed people were asked to take significant salary cuts. 2010 Tea Party candidate said that Americans were going to have to get used to lower wages, if the want to keep their jobs. Do you agree? At HP, some professional groups (EDS, et.al.) were forced to take across-the-board 25% salary cuts – Short-term productivity increased, HP profits hit all-time-highs, stock price rebounded rapidly (with a jobless recovery), and STILL the salaries most highly-productive HP / EDS employees with excellent performance ratings were NOT restored. As the former President and CEO of HP, anti-America, big-business, Tea Party candidate Carly Fiorena LAID OFF 30,000 HP EMPLOYEES and sent their high-tech jobs overseas to China, India, and Malaysia, while she tripled her own compensation, purchased a personal mega yacht, and five inefficient corporate jet airplanes for HP fat cat joy rides. Is that what USA needs? In 1957, Bill Hewlett and David Packard created “The HP Way” that focused on employee satisfaction as their source of success, but today’s greedy HP mismanagers have rejected their HP roots and done the exact opposite. Sam Walton had a preferred purchase plan to sell products that were “Made In America” where feasible, but look at the outsourced cheap junk in Walmart today. Sam Walton's idea was to bring income to Americans who could then buy WalMart products. Today, WalMart's International Headquarters in is China. America's 15 million unemployed and 40 million underemployed cannot even afford low-quality (often contaminated) Chinese products. Walt Disney’s 1966 idealistic goals for his Florida Experimental Prototype Community Of Tomorrow have long since been replaced with trailing-edge technology profiteering greed. The General Motors EPCOT Future World exhibit recently featured 22 mpg gas-guzzling SUV’s – at a time when Obama wants 62+ mpg. How very backwaRD AND sad for us all. The former world’s largest company “Heartbeat Of America”, that REFUSED TO INNOVATE for 30 years, and crushed their EV1 to make Hummers, is now bankrupt (except for taxpayer bailouts)! Do GM and HP foretell the future of "The American Way"? What will YOU do? In the beginning, HP became famous for innovative top-quality electronic engineering equipment, made by motivated employees to the highest possible standards. After NASA used slide rules to send men to the moon, HP led the way with advanced scientific hand-held calculators (a major advancement of the day). When HP began building PC’s, they were industry quality-and-innovation leaders, but then Compaq began to take HP market share away. HP acquired Compaq, with the sinister goal of destroying the competition SO THEY COULD CHARGE HIGHER PRICES. This marked the great departure away from their founders’ faith in employee satisfaction, and signaled loss of HP’s former competitive edge. HP has lost the critical human resources and environment required to be a high-quality product line innovator. HP products are going the way of trailing-edge “me too” imported cheap junk - made with $1 per hour foreign labor. In November of 2009, HP used profits from cost cutting at EDS, etc. to purchase 3COM to compete with CISCO. satisfaction into the toilet as well? Are HP and GM the role models we want for the future of Heartbeat Of America? Are we as a nation now headed toward cardiac arrest? Parasitic Wall Street speculators love what HP is doing today – There is short-term money for them to make BEFORE HP goes bankrupt. Would you “buy and hold” HP as a long-term retirement investment? What happened to the value of GM stock in your pension fund when thwey went belly up? Is your mutual fund manager now getting paid to buy HP stock for you? We live in a very-greedy nation with exceptionally-perverse compensation incentives that REWARD THE WORST POSSIBLE BEHAVIOR of the narcissistic top 1% bourgeoisie mismanagers. We are long overdue for a total reinvention of an innovation nation, but a significant portion of capitalist Tea Party obstructionists (funded by Koch brother's big oil) resist the future. or a creative genius CEO who KNOWS that success depends heavily on employee satisfaction. When mismanagers cut salaries to increase profits, it leaves only the poor-performing people who can’t find a good job elsewhere. This quarter’s profits go up, but THE FUTURE BECOMES BLEAK. When spectacularly-stupid mismanagers cut salaries because times are hard, it destroys employee enthusiasm, motivation and loyalty. Individual employee contributions diminish – What incentive do they have to work harder or better, when their previous good performance is being punished by selfish executives who do NOT want to share their myopic prosperity with the people who created it? Employee job satisfaction plummets, as does end-customer satisfaction with their aging, lower-quality products and services. Would YOU buy a GM SUV or an HP (Compaq) PC? Obsolete unsatisfactory products result in loss of previous market share to better-managed, more-competitive, motivated, organizations with aggressive R&D funding. HP dominated desktop computer printers, BUT, the world is moving toward a paperless electronic economy. Many obsolete hardcopy newspapers and magazines have gone bankrupt, just like GM. Tree-killing traditional books are becoming eBooks – with a thousand of them fitting on a low-cost hand-held eBook reader or netbook. Paper-based information becomes instantly obsolete, and cannot possibly be kept up-to-date in real time. HP’s past product line inertia is headed for rapid decline. Where are their innovative popular products for tomorrow? Did you notice what Apple product innovations, sales, employee satisfaction and profits did, when the rest of the world was crashing? Their stock price has been a rocket ride since January 2009. Powerful new iPhones are everywhere. The iPhone generation has very-little need for HP paper printers or hardcopy anything. Electronic data can be instantly updated and distributed worldwide, in near-real-time. Where is HP’s iPhone? What will happen to HP printer sales tomorrow? Wall Street speculators haven’t a clue. EDS SHOULD have been a leader in rapidly pursuing Obama’s advanced high-speed rail information technology, but why should disgruntled EDS employees bother, when HP management rewarded their good performance with 25% salary cuts (while HP short-term profits are now very high)? Totally-perverse Wall Street thinks that cutting R&D to maximize this quarter’s profits is a wonderful thing to do. Do you to? HP / EDS OWNS the world’s most-successful super-fast-transaction-rate airline reservation system software. Sabre-style technology was also used for the very-successful French high-speed railroad service. HP / EDS should have dominated the American high-speed information technology future, BUT, HP mismanagers dumbly drove away their most-creative Sabre system inventors and innovators. And thus, HP committed long-term corporate suicide, for the sake of short-term myopic current-quarter profits. And of course, greedy Wall-Street, high-risk, selfish speculators (like those who nearly bankrupted the American economy in 2008) think that HP is doing everything right! How very-blind the mediocre-minded myopic majority of American mismanagers can be (sigh). When ANY company cuts wages and R&D expenditures, it is time to SELL THEM SHORT LONG-TERM (even though their superficial short-term profits are quite high). Shortsighted Wall Street is clearly full of induhviduals. Home foreclosures, bankruptcies, and toxic assets have drastically increased nationwide – Blowing a devastating $15 Trillion hole in our financial system in September 2008. In 1980, just before Ronald Reagan took office, the top 1% earned 8% of American income – Ronald and the Bush Dynasty made it their Top Goal to reduce taxes for the wealthy, (who paid for their elections) – By the end of 2008, the top 1% earned 23% of American income – More than the lower 50% of hard-working underpaid Americans. From 1981 through 2009, Reagan, Bush 1-and-2, plus 6 years of corrupt conservative House and Senate under Clinton, resulted in the largest gap between the incomes of the Top 1% and the American working class (who produce our GDP), SINCE THE 1800’s. Is this kind of non-innovation a sustainable trend for our grandchildren? Is there any realistic plan to reverse today’s severe American jobless decline, or is our current deficit spending, and borrowing from our grandchildren’s future, making our economic future very-much worse for our posterity? Throughout human history, when the gap between the GREEDY Top 1% and the working middle class became too large, Revolution Ruled (remember the terrible stories about the French Revolution guillotine). In 28 years of Reagan, Bush, Clinton, Bush, rewarding the rich and NOT sharing it with the workers has greatly diminished the USA middle class, and left America deep in debt, which we immorally borrowed from our grandchildren. We are approaching $14 Trillion in U.S. national debt, divided by about 300 million American, means that every newborn baby will soon begin life with a $50,000 debt burden PLUS growing interest payments each year (to China, Japan, OPEC, and Russia) that seriously detract from future government services, AND our grandchildren’s potential prosperity. 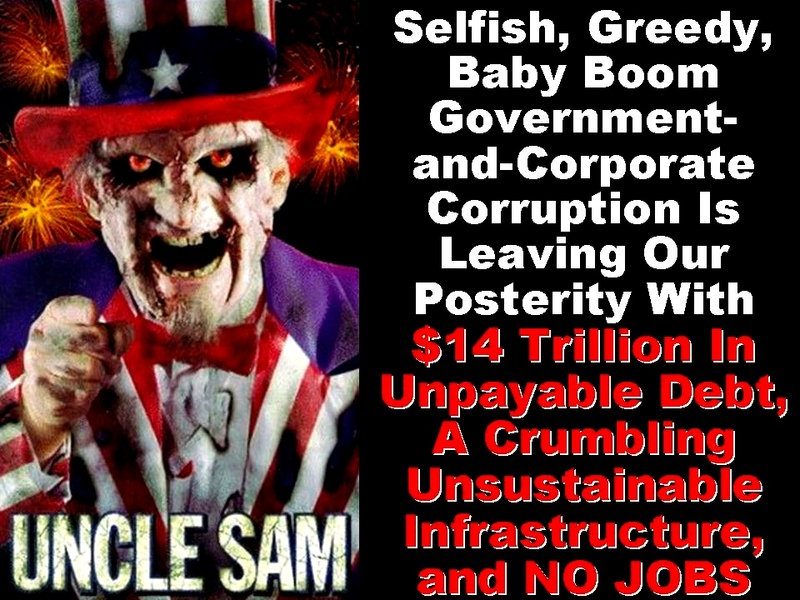 What an immoral nation of selfish “generational thieves” the Bad Baby Boom leaders have become! We desperately need a happy / healthy middle class that is well-motivated-and-rewarded for increasing productivity, NOT PUNISHED when they make greedy HP-like executives and parasitic Wall Street speculators wealthy. Today’s perverse partisan politics is doing the EXACT OPPOSITE of what we desperately need, with powerful counter-productive DISincentives for the vast majority of working, unemployed, and underemployed Americans. This extremely-negative sinister trend is TOTALLY UNSUSTAINABLE in the long-term. Over 80% of Americans now feel that our government and corporate greed are destroying our economy AND opportunities for our children’s future. The vast majority are “as mad as hell” and won’t tolerate selfish greed and corruption-as-usual any longer. The next election may be a disaster for most incumbents, regardless of their party-or-corporate affiliation. Knee-jerk, pendulum-swing politics may get even worse tomorrow. The majority of the pain Americans feel is based almost entirely on very-high Total Unemployment, which is linked to our extreme inefficiency and the high cost of deadly imported oil. Most Americans now believe that we are the first U.S. generation to leave a future for our children that will be WORSE than we inherited from our own parents. Johnny Appleseed traveled across early America teaching settlers to plant fruit trees for their grandchildren. BUT, overpopulation and Greedy Baby Boomers are now selfishly exploiting unsustainable worldwide resources, destroying 50,000 acres of trees a day, badly polluting the world, building-and-buying obsolete fossil-fuel products that are making our future much worse, leaving American children with $40,000 of impossible-to-repay debt plus interest on the day they are born, AND underfunding declining U.S. education, with very-little opportunity for a good job in the future. Unmotivated high-school dropouts are committing career suicide, which also drives down America’s ability to compete internationally. Our creative math and science skills have fallen below most third-world countries. Is anyone at all concerned? What are YOU going to do to reverse the downward decline of our once-great nation? Patriots must now wake up and defend our dying nation against our own government corruption. Milton Friedman’s 1964 Negative Income Tax proposal is NOT the correct answer to massive unemployment. He recognized the Unemployment / Productivity Paradox, BUT, his NIT proposal was NOT a viable solution to it. Neither are previously-failed worldwide socialism-or-communism experiments. We do NOT have a working demonstration of what tomorrow SHOULD look like anywhere in the world today. Disneyland’s aging Tomorrowland and Disney World EPCOT Center Future World are not even close to Walt’s original 1966 goals, much less what we need today and beyond. We know that the social-and-economic systems of today are very UNSUSTAINABLE – Capitalism, democracy, socialism, and communism have all failed to solve man’s selfish greed. Radical reinvention of a much-happier future potential is long overdue. What are we going to do? Should we borrow even more, and leave every newborn child with a MILLION dollars of debt, and no ability or opportunity to repay it tomorrow? Will the world stop loaning us more money, and even foreclose on the fiscally-irresponsible growing debt that we cannot repay now? China is the largest holder of American dollar debt. In November 2009, they formally warned our borrow-and-recklessly-spend government that China will NOT support ongoing USA deficit spending, and a stated Obama Administration formal policy of devaluing the U.S. Dollar even further. China will NOT tolerate their investment in America to continue to significantly decline, especially since we are now paying nearly zero interest on what we have borrowed from them. In the same month, the World Bank warned America that we cannot continue to drive down the value of our dollars, without international economic leaders abandoning the greenback as the unit of international trade. That would make everything we import much more expensive, and destroy our future exports. Many angry OPEC nations already want to shift away from selling oil based on declining U.S. dollar price. India sold declining U.S. dollars and purchased 200 METRIC TONS OF GOLD at gold’s highest price ever, as a hedge against the predictable near-future collapse of the U.S. dollar. Do you own any declining assets valued in U.S. dollars? Should you continue to? As the dollar goes down in value, it takes many more of them to buy things, including stocks. It appears to the naïve that the U.S. stock market is going up, but what is really happening is that it takes more dollars to buy stocks that have NOT changed value. Our GDP may appear to rise somewhat, but since it is based on declining dollars, rising GDP just means that it takes more declining dollars to buy the same old quantity of bread and milk. Gold is a commodity that has an essentially constant worldwide value. In the twentieth century gold was worth $32 USD per ounce. In November of 2009, gold sold for over $1100 USD per ounce. GOLD IS NOT WORTH MORE TODAY – Today’s U.S. dollars are now worth LESS than $0.03 of former U.S. Gold Certificate Dollars. A one-ounce $20 gold coin could be used to buy a nice man’s suit a century ago. How many nice men’s suits can you buy with $1100 worth of gold today? Today’s business suits should actually cost much LESS than they do today. The higher-quality fabrics are now made on very-precise machines at exceptionally-low cost. Automation and improved productivity are MUCH greater than a century ago. The reason today’s business suit cost as much as they do in megacities is because they are now made half-way around the world and require a lot of petroleum as they move from one person to the next along the very-inflated value chain. The same imported suit sold in a high-cost-of-living megacity, costs several times more than in Middle America. But, if taxpayers are subsidizing your $8-million per year Wall Street salary, who cares if a suit costs $1,000 more in NYC than the same item in Kansas? With the U.S. dollar rapidly declining in 2009, India decided that owning constant-value gold was much better than owning any declining U.S. dollars. How many thousand U.S. dollars will it take to buy one gallon of imported oil in the 21ST Century? Will you need a wheelbarrow full of worthless $100 bills to buy one low-quality hamburger? How much will you be paid for a day’s hard labor (IF YOU CAN FIND A JOB)? 70% of Americans will lose their current job in the next five years. Will you? We have clear documentation of other failing countries intentionally driving down the value of their currency, long before USA started playing this deadly game. Are you leaving a legacy of declining dollar-based assets for your children? What will the value of your retirement savings be, when you are no longer able to work? We know for sure that USD-based Social Security and Medicare are already actuarially unsound. What is YOUR security? Do you have faith in our American future? Is anyone paying attention to the cataclysmic damage that short-sighted greedy parasitic salary-and-R&D-cutting Wall Street speculators and our own government are doing to America’s economic future - Creating massive job losses for the former Economic Leader of the World? What will we do when no one will loan America any more money for our out-of-control deficit spending? We can NOT continue printing billions of worthless U.S. Dollars, and trying to borrow our way to prosperity and full employment! Productivity must increase dramatically, but along with it, we MUST create countless never-before innovative products and services that provide great jobs for EVERYONE who wants one. We must invigorate a new majority middle class. NO MORE INCREASING UNEMPLOYMENT WHEN U.S. GDP AND PRODUCTIVITY INCREASE! Anything that detracts from full employment with a Living Wage is THE WRONG THING TO DO (despite what greedy Wall Street wants). With this Compelling Vision constantly in mind, the rest is just working out a very-long list of Emerald Eco-City details. We need to totally reinvent existing compensation, counterproductive greed, selfish non-sharing wealth accumulation, welfare and entitlement programs. In a highly-productive, prosperous nation (or Eco-City), we do need to generously provide for our children, sick, elderly, injured veterans, disabled and the truly needy (through no fault of their own). I once served as an IBM representative to The United Way. I had the wonderful opportunity to visit facilities that provided meaningful rewarding jobs to people with a wide variety of various disabilities. It genuinely impressed me that caring people CAN provide a rewarding life for those less fortunate, AND make them feel happy to be contributing to the society they are part of. It is too bad that such successes are hidden from the majority. Good News does not receive sufficient media coverage in America, as clearly demonstrated by rampant national cynicism. True love of humanity is much more than a (fraud-riddled) handout. Love is a HAND UP to personal dignity and meaningful self-respect. Visit your local United Way / Community Chest – There is a lot to learn. Similar community-supported programs cost far less, and are much-more beneficial than the kind of badly-mismanaged federal mega-welfare that is draining our very-scarce government funds today, and contributing greatly to burdensome fraud and debt being passed on to our posterity. Everyone who is able and who wants to work should have access to ZERO UNEMPLOYMENT meaningful jobs. AND, they should receive a fair “Living Wage”, including all essential lifetime benefits. A Living Wage should not be a NIT “free gift” that encourages fraud or dead-beat laziness, but rather FAIR COMPENSATION that enables continual iterative refinements that contribute to improved productivity, and to a steady stream of valuable new product-and-service innovations. As productivity rises, and less labor is required to deliver more products and services, the number of creative new never-before jobs MUST ALSO INCREASE. It takes 100,000 new jobs a month, just to keep even with rapid American population growth. It will take 15.5 million non-existent permanent new jobs to reach full employment in 2010. Who has a practical plan to make it happen quickly? Do you say: “It’s not my job to create new jobs.” If not YOU, than who? Are you as smart as a parasitic Wall Street speculator(who destroyed the U.S. economy in 2008)? Are they as smart as a 5TH grader? Can you run a small company as well as some of the people you have worked for (who laid you off). Do you recognize more value in yourself than they did? When America went from 41% farmers to less-than-2%, it freed up human creativity to go to the moon, invent computers, Internet, iPhones, and so many other wonderful technology “toys” and productivity enhancements. As most American lose their obsolete jobs in the next 4-to-5 years, what will we do with the unlimited creative human potential? Sam Walton took advantage of hard-working unemployed farm workers. Who-and-what will provide jobs for the majority of tomorrow’s newly unemployed? It will be a huge human resource pool. Will we just let them starve, OR discover countless never-before creative opportunities for EVERYONE? Zero Energy Design has a very-specific plan that is significantly driven by today’s powerful unemployment motivation. Solving ALL of the above well-documented society mismanagement problems is a PRIMARY GOAL of our aggressive ZED Emerald Eco-City development project. We will begin with the world’s largest collaborative design project, then employ tens-of-thousands of highly-skilled construction workers in state-of-the-art innovative technologies, and then we will establish high-paying new Eco-City professions that support a million permanent residents. We fully intend to reeducate the rest of the world about what full-employment tomorrow can-and-SHOULD become. Emerald Eco-City will be the most-advanced concentrated Think Tank in the history of mankind. Would you like to become an early adopter and leader in such a wonderful society? Employee satisfaction will be paramount to our success. We would be crazy to try to drive down salaries, when what we really need is a highly-motivated team of the world’s best-and-brightest experts at everything. An Emerald Eco-City Living Wage will include good/fresh/locally-grown food, safe-and-clean environment, clothes, home, transportation, primary-and-ongoing state-of-the-art education in an expanding universe of demonstrated endless possibilities, superior security (fire, crime and disease PREVENTION), with timely-access to good healthcare, and spectacular new family entertainment for everyone (much better than any Disney dream). Since most humans live longer than their productive employment years, a Living Wage must also include an actuarially-sound, secure pension plan that will provide everyone with a comfortable, full life as long as they live. It should realistically assume that many healthier disease-prevention people will live even longer in the future (UNLIKE the nearly-bankrupt actuarially-unsound American Social Security and Medicare systems that we already KNOW are insufficient for Baby Boomers). In recent years our “ Fast Food Nation ” , HP and many others have been steadily driving DOWN compensation. More-than half of Walmart / McDonald’s employees do NOT make a Living Wage. In the 1960’s Sam Walton recognized Milton Friedman’s Unemployment / Productivity Paradox. Sam hired millions of highly-productive hard-working underpaid people who were leaving family farms (in Arkansas, Oklahoma and Missouri). His vision, treating employees as “associates”. and “management by walking around” skills created a very-profitable world-leadership company. I knew Sam casually. He and I flew our private airplanes into some of the same airports. He was a wonderful generous mild-mannered man. I even worked on some of the early Walmart artificially-intelligent software architecture. Our world needs more Sam Waltons. Sam wanted most Walmart products to be “Made In America”, where it was feasible. He help spawn many small mom-and-pop manufacturing firms for clever simple inventions. Since Sam’s death, the greedy executives who took over his legacy have selfishly driven wages down as low as they can go. Walmart moved its International Operations Headquarters to cheap-labor-and-low-quality-products China. Half of Walmart employees who are eligible for healthcare insurance now can NOT afford it (which saves Walmart executives even more money). This is a very-negative trend for America, where 40% of residents now make far-less than a Living Wage, pay no income taxes, and are an economic-and-social-burden on our declining deficit-spending society. Millions of unmotivated deadbeats are on some type of mismanaged government welfare entitlement program (that is full of bureaucratic overhead, fraud, and ongoing criminal abuse at all levels). In essence, taxpayers are paying a significant portion of the salaries of ALL people whose employers pay them less than a living wage. This should be considered a felony crime against taxpayers. Your total taxes are higher than they should be, so big-business-chain executives can line their pockets with excessive compensation. This unsustainable trend is getting worse every year, badly damaging our entire jobless recession nation. When you consider the BIG picture, the TOTAL costs to society of those low-quality (sometimes polluted, unhealthy, often-imported) products at Walmart, McDonald’s, et.al. are MUCH HIGHER than what shows up at the cash register. Outsourcing and illegal immigrant criminals have stolen many jobs, and clearly driven up American unemployment numbers to all-time-record-highs. And, it is now taking much longer to find a replacement job, at a lower salary than before. The ONLY way to solve these growing pervasive unemployment / underemployment problems is to take two giant steps backward, look at the big picture, and solve the problem with Holistic Systems Integration / Optimization. It must be done on a macro (not micro) scale. Only then can we ensure that every productive full-time worker makes a Fair Living Wage, while contributing to ever-improving economic productivity. Jobs and productivity do NOT have to be mutually exclusive, as our Emerald Eco-City plans explains in great detail. Our society-wide problems cannot be solved by one mom-and-pop small business. It takes a much-larger community-wide perspective, and a scalable demonstration project. It CAN begin with a self-sufficient Emerald Eco-City of one million people, and THEN its infrastructure, organization, policies, success and lessons-learned can be imitated by many future eco-cities worldwide. It WILL require the boldest creative imagination in all of Earth’s human history, which we are more-than-prepared to immediately help lead. All of mankind’s previous great leaps forward began with a tiny spark of creative imagination. A handful of WACKO Inspired Believers CAN Radically Improve the Entire World. In fact, that is the ONLY way major society changes have ever happened before. Today is THE day that those caring people who understand our goals, benefits, necessity-and-motivation for the success of Emerald Eco-City must unite to correct the worst problems ever created by virulently-ignorant suicidal humanity. R U INSPIRED, OR SATISFIED WITH THE STATUS QUO? Will you be part of the sustainable solution, or the problem source? Lead, follow, or get out of our way – We cannot afford to delay. Our aggressive Emerald Eco-City project can NOT afford any UNSUSTAINABLE STUPID DETOURS. We are NOT looking for CO2 reductions. We demand ZERO Emissions: Never Burn ANYTHING. ZERO UNEMPLOYMENT is a similar No Compromise Emerald Eco-City goal. Even though the myopic masses have been forced to tolerate unfair wages as “business-as-usual”, WE will demonstrate the sustainable Living Wage solution, instead of contributing to today’s many unemployment / underemployment problems. Our exciting innovative approach to Emerald Eco-City full employment and abundant living in harmony with Nature, will be designed to be THE most attractive place to work and live in our new SUSTAINABLE and PROSPEROUS worldwide future. Many people consider the title of this section an impossible self-contradictory oxymoron. My unique lifetime of experience proves that it is NOT. (3) Nearly-instantaneous worldwide Internet collaboration potential than ever before. What we are very short of today is genius leaders who have the first clue how to ENABLE CREATIVITY in everyone. In a traditional World-War II top-down authoritarian military-style corporate-and-government chain of command, you most certainly can NOT tell your subordinates WHAT to discover in an unprecedented world of endless opportunities (that badly needs never-before innovation). You can dictate funding goals (like full employment and product innovations), but managers who lack know how cannot dictate “how” to meet their stated goals from the top down. When Thomas Edison developed his incandescent light bulb, no one could tell him to then invent high-bandwidth laser telecommunications, etc. Top-down management can NOT dictate future specifics about which they haven’t even a clue. Innovation must be built one plateau at a time, by many people standing on the shoulders of previous intellectual giants. How then can anyone ever hope to “Manage Creativity”? The previously-proven answer is to “Enable Creativity” (instead of suppressing it). Before you can begin to teach a new class, you must first understand it yourself, (which when came to Enabling Creativity was NOT precedented, or easy for me to do). Each time you teach a unique class, you learn more-and-more from your participants. I learned a special lesson from a $25,000-a-day 1980’s consultant (James Martin) that my company hired for a week at a time. His secret technique for becoming “The World’s Foremost Expert” was to claim that he was, when he was not, AND THEN pay close attention to all critics who told him where he was previously wrong. Our goal is NOT to prove that we were correct yesterday, but rather that we actually become World’s Foremost Experts tomorrow. And so I have done successfully for three decades. A person’s perspective as a mentor is elevated again-and-again to higher plateaus, as you add one new insight on top of another. Each new plateau allow you to see things that non-learning cynics will never understand. I ALWAYS learn from my students’ perceptive questions. I strongly invite and appreciate constructive criticism. My goal is NOT to prove that I WAS right, but rather that my knowledge of Scientific Truth continually improves in the future. Admitting my own previous mistakes is a first step toward successful creativity, and eliminating future mistakes. I love it when anyone points out a flaw in something I say – I grow and learn a lot from my rivals. And now, I can honestly claim to BE the world’s foremost expert at what I have chosen to do for my life’s work that I love so very much. One serious pitfall for any leading-edge research scientist, is that a unique genius (like Einstein) can become such a nerdy geek that he cannot communicate effectively with mere mortal mediocre minds. Very few common people fully understand the potential of e = mc2, a century later, and yet Albert’s 1905 concept seems overly simplistic to today’s quantum physicists. Einstein said: “If you can’t explain it to a six-year-old-child, you do not understand it yourself.” – Very challenging for a leading-edge research scientist with his head full of unintelligible mathematics, unique esoteric theories, and technical jargon. So, How Can A Nerdy Geek help a failing society with high unemployment Enable their Own Creativity and create millions of never-before jobs? If I had communicated effectively about my near-zero-energy house in 1979, America would be spending $250 Billion LESS each year on home energy today. Obviously, I failed to communicate the scientific truth very well then, as a young research scientist. Have I learned anything about leading-edge human communication and motivation in the last three decades? I hope so, but only YOU who see my material and take aggressive action can answer that question in the future. What will our intellectual legacy be? Answering that generational question is my most-powerful motivation today. Many things have influenced our view of Enabling Creativity over the decades of a successful career.